Samsung UE32M5500 review | What Hi-Fi? In our recent review of the UE40MU6400, we point out 40in is quite a small screen by modern standards. But for some situations, even this could be way too big. You don't necessarily want a TV that size in your bedroom, for example. So is there still a place for 32in TVs such as this Samsung UE32M5500? Going for a 32-incher means you miss out on many of the more advanced features seen on bigger models – 4K and HDR are out for starters – but if you’re watching the box in the boudoir, that’s probably not a huge concern. Besides, in most other ways this is an extremely likeable little set. Compared to its bigger, more premium siblings, the UE32M5500 feels decidedly flimsy - but it looks fairly smart from a distance and, thanks to a relatively thin chassis and slim bezel, it takes up very little room. There’s no One Connect box here, with all of the connections housed in a recess in the back panel. You do, though, get two remotes in the box – the generic Samsung zapper you get with all 2017 Samsung TVs and the matte black, plastic wand familiar from the MU range. Neither has shortcut buttons for the likes of Netflix or Amazon, and the wand is perhaps a bit too stripped-out for its own good (a mute button would be nice). But two remotes means you’re bound to find one that suits - and have a backup if/when the dog chews one of them to pieces. The wand remote also brings with it voice control, but it’s not so good you’ll be using it regularly. We find it useful for activating Game Mode, which is otherwise buried irritatingly deep in the menus. The M5500’s interface is exactly the same as that found on every other 2017 Samsung TV, right up to the £4500 65in Q9F - and it's absolutely brilliant. Only LG gets close this year for slickness and presentation, and we reckon the Samsung system is snappier - although we did encounter the occasional hesitation we’ve not experienced with other models in the range. It’s got every app you could possibly desire, too, including usual suspects such as Amazon Prime Video and Netflix, slightly rarer big-hitters like Now TV and Google Play Movies and TV, and all five of the major catch-up services. That sort of breadth of content is especially important in a bedroom TV, as it means no extra boxes are required in order to access the content you desire. To get the best out of the M5500 we recommend dropping the backlight, contrast and sharpness a few points. On their default settings they exaggerate the picture in a way the TV isn’t really comfortable with. But regardless of how much you tweak the picture settings, it's very difficult to get pure, punchy whites from the M5500. Partly this is on account of its relatively unimpressive peak brightness, but it’s more to do with an oddly lukewarm colour temperature (even on the coolest setting). This is the only significant criticism we can aim at this Samsung, but it becomes less of an issue as you become accustomed to its warmer balance. It’s certainly not so prominent as to be noticeable in isolation. Play Marco Polo via Netflix and, while the punch and insight of a more upmarket TV are clearly missing, the M5500 makes for a very pleasant watch. Colours are on the warm side, but not overly unbalanced or unnatural, and contrast is even - impressive black depth makes up for the lack of punch and purity in the whites to produce an enticing scene. Motion is impressive too, arguably more so than on many larger 2017 Samsungs we’ve seen. There is a little bit of blur in extremis, but it’s not bothersome and pans are smooth. Switch to a Full HD channel via the Freeview tuner and you get fairly punchy colours, naturally nuanced skin-tones, crisp edges and plenty of detail. Stray into standard-def land and you might be surprised by the clarity and cleanliness of the image. Of course, a TV this size and resolution has a much easier task when it comes to upscaling than its 4K brethren. In terms of sound, the M5500 is no better than passable. The treble is a bit thin and hard, bass is artificial and monotonal - but it’s only what we expect from flatscreens, particularly those of this sort of size and price. The midrange is still pretty well projected, too, so if you really don’t want to add a soundbar or base you will at least hear Bear Grylls clearly as you drift off to sleep. The UE32M5500 feels like a step back to a time when 32in still meant a big TV and when HDR was still a twinkle in the eye. The lack of punch is a surprise by modern standards, and the slightly steamy whites are a little bothersome. 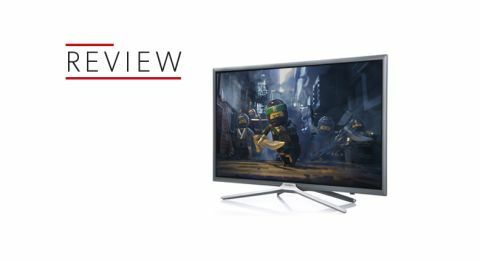 There’s a strong argument you should simply stump up the extra £180 and buy the UE40MU6400 instead, which is a lot more telly in just about every way. But for some, 32in is the biggest TV they want or need, particularly if it’s a second or even third TV. That means settling for a less advanced, less sophisticated model - but if you’re prepared to make that trade-off in return for a TV that’s genuinely compact by modern standards and performs stoically, the M5500 will be hard to resist.